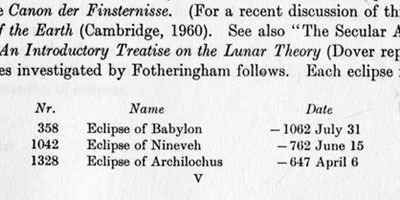 This is important because the basis of all chronology is ultimately solar eclipses and other astronomical phenomena, for which we consult astronomical reference works, like Tuckerman, or Oppolzer’s Canon der Finsternisse, or Meeus’ more recent eclipse canon: we thus need always to remember that in such works, dates before Christ will be 1 off from our everyday reckoning: the 1961 Dover reprint of Oppolzer dots the i’s, as can be seen in this photostat: as Jona will tell us, the famous eclipses listed here (there are more on the next page) are referred to by everyone except astronomers as those of 1063, 763, and 648 B. C.
The closely related error of ignoring what the ancients meant by “20th year” or “20th day” pops up in all kinds of circumstances, and writers need to be careful. In ancient medicine, the Great Climacteric, the 63rd year of a person’s life, starts when that person turns 62, not when they have accomplished a full 63 years: a matter I’m amusingly aware of this year, since I turned 62 last November. References to “quinquennial games” are to games that occur every four years by our reckoning: and the kind of trouble modern writers can get in, leading to quack-like theories, is beautifully seen by the wrong-headed speculations of several amateur chronologists: see for example the edition of “De Die Natale” (sic!) by William Maude, 1900, where he refers with pride several times to an entire book he seems to have based on this misunderstanding of his: p21. Similarly, I periodically get mail, sometimes irate, from modern astrologers whom I have the misfortune of reminding to be wary of the degrees of the exaltation of the planets. . . . This entry was posted on Monday, April 23rd, 2012 at 12:39 am and is filed under ancient history, common errors about Antiquity. You can follow any responses to this entry through the RSS 2.0 feed. You can leave a response, or trackback from your own site.